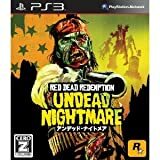 The Red Dead Redemption: Undead Nightmare Collection is a collection of three downloadable content (DLC) releases for the open world third-party shooter, Red Dead Redemption on a single PlayStation 3 disc. A stand-alone release, meaning that the original Red Dead Redemption game is not necessary for play, the three DLC bundled here include: the Undead Nightmare Pack, the Liars and Cheats Pack and the Legends and Killers Pack. Together these three contain a new single player adventure featuring John Marston in a zombie-stomping storyline, hours of new gameplay, new multiplayer maps and play modes, new characters, mounts, new hunting opportunities and weapons. The Zombie Horde Invades the Old West As with many console based action-oriented games, the playing experience of Rockstar Games' popular, American Wild West based, third-person shooter, Red Dead Redemption, has been supplemented by several downloadable content packs since its mid-2010 release. Players on the PlayStation 3 platform that are connected online have been able to partake of these via the PlayStation Network. Now offline players can do the same with the Red Dead Redemption: Undead Nightmare Collection. The collection consists of three of the five available DLC packs on a single disc - these include the Undead Nightmare Pack, the Liars and Cheats Pack and the Legends and Killers Pack. In addition to adding playable content for owners of the original game, the collection serves as a standalone game release, that allows players who have not purchased the original game to experience the gameworld of Red Dead Redemption for the first time on disc via the new zombie-themed single player adventure built into the Undead Nightmare pack, as well as multiplayer functionality. The other two packs add new weapons, characters, multiplayer options, ridable mounts and more to either the existing game or a standalone play experience built around the content of the Undead Nightmare pack. 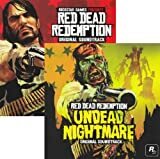 Available together in their official deluxe CD releases only for a short time, the soundtracks to Red Dead Redemption and the follow-up Undead Nightmare are must haves for any fans of the games or video game scores. ABOUT THE MUSIC OF RED DEAD REDEMPTION: Composed by the critically acclaimed recording artists Bill Elm and Woody Jackson and produced by David Holmes, the Red Dead Redemption Soundtrack Album is a lush and emotive score that captures the haunting sound of the dying American West and Mexico at the turn of the century. Filled with sweeping strings, martial timpani, and piercing horns, this music was performed on authentic instruments of the period. Additionally, Jose Gonzalez and Ashtar Command, both composed wholly original songs in "Far Away" and "Deadman's Gun" respectively for the soundtrack album. William Elliott Whitmore gave a haunting a cappella rendition of the western standard "Bury Me Not On The Lone Prairie", while Jamie Lidell submitted a special edit of his song "Compass". Each vocal track adds a dually authentic yet contemporary flair to the atmosphere of the album. 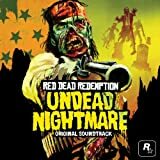 ABOUT THE MUSIC OF RED DEAD REDEMPTION: UNDEAD NIGHTMARE: Acclaimed composers of the original Red Dead Redemption soundtrack, Bill Elm and Woody Jackson return for the terrifically spooky soundtrack to Red Dead Redemption: Undead Nightmare. Radically transforming the beautiful frontier landscapes of the original game into a B-movie zombie horror apocalypse, Undead Nightmare has a suitably eerie instrumental score accompanied by epic Southern Gothic rockabilly tracks from guest performers, Kreeps and Misterio. Seemingly overnight, a zombie plague ravages the once bountiful frontier, decimating the landscape and reawakening the dead. In towns, settlements, and outposts throughout the world, the uninfected citizens are left to fight for survival against waves of the undead. John Marston must ride out into the vast and terrifying world and survive long enough to find a cure. With four unique zombie classes - each with their own characteristics, plus new infected predatory animals roaming the countryside, and non-traditional weaponry like the Blunderbuss - which can be loaded with looted remains of fallen zombies, the Undead Nightmare Pack offers an entirely original game play experience for fans of Red Dead Redemption. Additionally, the deadly Tomahawk and the Explosive Rifle make a triumphant comeback and will be available exclusively for those who downloaded the Legends and Killers Pack and the Liars and Cheats Pack. The all new single-player narrative features new challenges, quests, and ambient events, including Missing Persons, where you must find a missing survivor lost amongst the throngs of undead. This new release also brings new content to Multiplayer, with Undead Overrun, a brand new multiplayer survival mode where waves of infected enemies attack and players must work together to stay alive against increasingly difficult odds. Red Dead Redemption is a Western epic, set at the turn of the 20th century when the lawless and chaotic badlands began to give way to the expanding reach of government and the spread of the Industrial Age. The story of former outlaw, John Marston, Red Dead Redemption takes players on a great adventure across the American frontier. Red Dead Redemption is a Western epic, set at the turn of the 20th century when the lawless and chaotic badlands began to give way to the expanding reach of government and the spread of the Industrial Age. The story of former outlaw, John Marston, Red Dead Redemption takes players on a great adventure across the American frontier. The Legends and Killers Multiplayer Pack: Adds to the Red Dead multiplayer experience with nine additional active Competitive mode map locations tailored for multiplayer action, 8 playable characters from Red Dead Revolver, the devastating Tomahawk weapon and more. The Game of the Year Edition includes the full Red Dead Redemption game and all current free and paid DLC such as 'Undead Nightmare', 'Legends and Killers Pack', 'Liars and Cheats Pack', 'Hunting and Trading Outfits Pack', 'Outlaws To The End Co-Op Mission Pack' and the recently released 'Myths and Mavericks Bonus Pack'.It will also feature the Deadly Assassin Outfit, War Horse and Golden Guns Weapon Pack pre-order DLC and the 'Solomon's Folly' single-player gang hangout and challenges. Red dead redemption: game of the year edition will include the full, original red dead redemption game plus all free and pai d downloadable content packs released to date, including the w ildlypopular undead nightmare single and multiplayer offerings, as well as all dlc originally released as pre-order content. "The Game of the Year Guide" covering all things Red Dead Redemption. Take a step back in time to the American Old West and follow John Marston as he sets out to hunt down his former gang members in Red Dead Redemption. This must-have guide covers everything from the original game, along with all three DLC releases - Liars and Cheats, Legends and Killers, and Undead Nightmare. Features never before seen sketches and it's very own art gallery, as well as extended coverage of walkthroughs, challenges, achievements and trophies. This special edition "Game of the Year" guide is a collectible for all Red Dead Redemption fans and not to be missed.